Microcrustacean plankton was sampled in the Danube River just upstream and downstream of Budapest, a large city with considerable industrial and municipal discharges. I addressed the questions of whether (i) there is any longitudinal variation in the densities and community attributes of microcrustaceans, and (ii) how these relate to river flow and nutrient discharges. Microcrustacean densities and diversities varied significantly between upstream and downstream sites as well as between different hydrological phases. Densities recorded in high water upstream were comparable to those recorded downstream, densities in low water, however, were considerably higher downstream. High water was associated with increased densities and diversities. The number and relative abundance of tychoplanktonic species considerably increased in high water. All those findings suggest the importance of downstream transport from adjacent water bodies. Diversities did not experience a downstream decline, and the effects of waste water discharges cannot be detected irrespective of the flow regime. The results indicate that effects of waste waters are embedded within the river flow effect in such a way that the latter appears to mask the impact of nutrient loads. This study provides further evidence for the flow regime as a major driver of biodiversity in floodplain rivers. 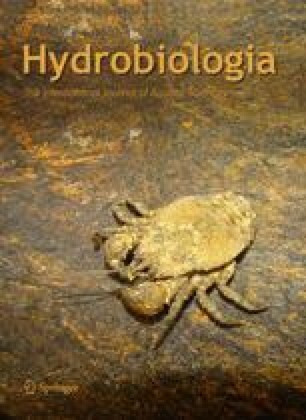 The author thanks Dr. Katalin Zsuga and Prof. Árpád Berczik for helpful comments on the research plan and providing assistance in identification of microcrustaceans. Anonymous pilots of the ferry boats greatly assisted sample taking both upstream and downstream of Budapest. Physico-chemical data were provided by the Environmental Authority (Közép-Duna-völgyi Környezetvédelmi, Természetvédelmi és Vízügyi Felügyelőség), discharge data were supplied by the Hungarian Environmental and Water Research Institute (VITUKI). Magdolna Makó and András Kasek (Budapest Sewage Works Ltd.) kindly provided data for industrial and municipal discharges. The author is indebted to György Jablonszky for helpful comments on the language of the manuscript and for creating the map of sampling sites. The author also thanks Tim Hague for improving the grammar of the manuscript.